Size: Egg is about 6 inches across! 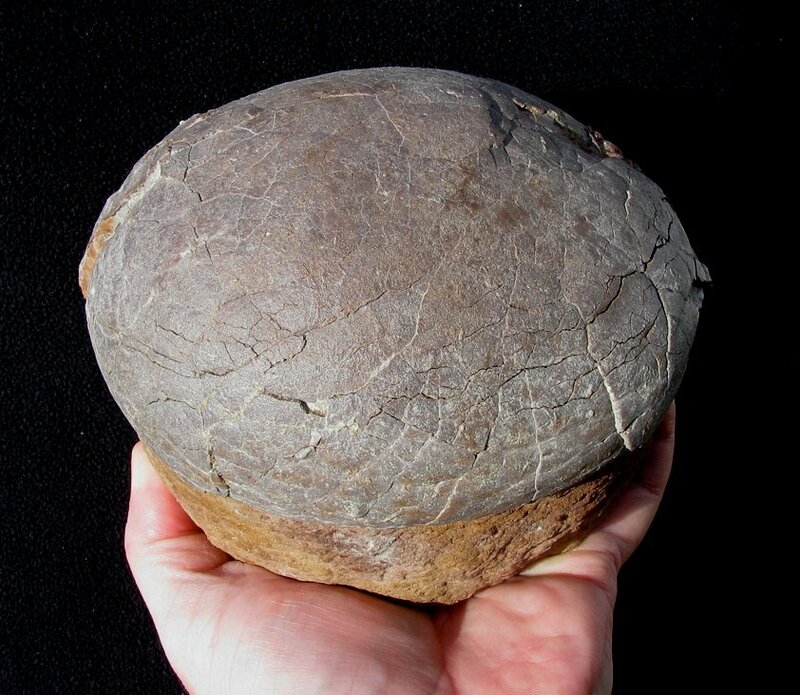 This dinosaur egg is from a hadrosaur-type dinosaur (duckbill). Most hadrosaurs laid their eggs in nests of a dozen or more eggs. Usually, hatching and scavenging damaged the nests, obliterating any trace of the eggs that remained. Occasionally, some eggs survived predators and the elements, and eventually became fossils. Because of their delicate nature, intact eggs are very rare in the fossil record. Dinosaur eggs that retain their original shape and eggshell are some of the most collectible fossils in the world. This specimen was recently acquired from the Richard Busch Collection. Busch was the Preparator/Asst. Curator at the North Museum in Lancaster, PA from 1965-1992. This amazing Dendroolithus (Hadrosaur Egg) specimen was imported legally many years ago, unprepared, and then microscopically-prepared with an air-abrasive machine to reveal the fine detail of the eggshell. But the most collectible feature of this egg is that it HAS NO REPAIR AND IS FULLY UNRESTORED AND UNPATCHED! Almost every dinosaur egg has missing spots that warrant repair or patching - this egg is fully intact and complete, as it was found. The eggshell covers almost all of the surface of the egg, which is extremely unusual. The egg is quite inflated and sits on a very nice, natural pedestal of matrix. The overall ''egg'' shape is very distinct, and the entire fossil displays beautifully. 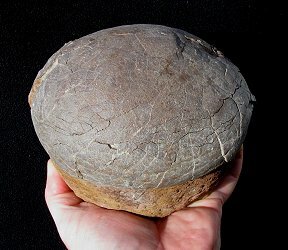 This is a top quality, extremely collectible and displayable example of a textbook UNRESTORED Hadrosaur dinosaur egg from the Cretaceous of China.